Im very happy to join the PT Today expat panel and hope to bring you all relevant information to help you achieve business success. To get the ball rolling here is a bit about me and my experience within the fitness industry. So, you should know I’ve been a Personal Trainer. I was PT at the Langham Hilton in Regent Street, London, at Vision Personal Training in Sydney, Australia today one of the largest PT studio chains in the world with 50 studios across Australia and a $40 million a year annual turnover. I was at the very first. PS I lived in Australia for 4 years. And in Spain where I ran my own fitness studio and mobile PT business. And I have been a Coach. I am the owner of the European Institute of Fitness. Founded in 2005, we have PT Schools in the UK, the Maldives and Bahrain. Indeed, we have graduates in six continents and more than 30 different countries around the world. I am a business coach. I run business retreats in Spain for trainers to get away and work ON their business instead of IN it. 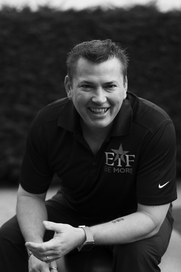 And I coach a range of clients online to help them build their fitness business with confidence. I don’t support the notion of buying or copying somebody else’s “blueprint” for success assuming what allegedly worked for someone else to make money will work for you. In the same way I don’t believe how you keep fit should be the blueprint for your clients either. I believe in helping others create their own formula for success personalised and tailored to their situation and circumstance. And I am lucky to have such amazing clients and students. Thank you. I love being a coach and hope if you are ready and would either like a coach or feel ready to become a REAL coach and SMILE….I might hear from you soon. Well that’s probably about all that is even slightly interesting. I mean I have two lovely children, I live in Spain, enjoy kayaking, running, cycling and a bit of gym. I have self-published a couple of books, presented at national conferences in sports science and cardiac rehabilitation, and published in peer reviewed journals. Other than that message me if you want to know more.